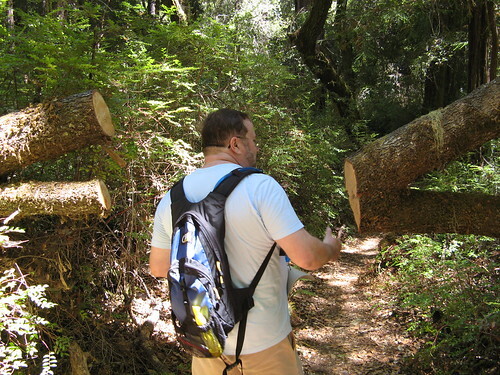 It can’t be an epic adventure every week (and given my proclivities for safe, easily accessible nearby trails, my adventurers aren’t all that adventurous anyway). 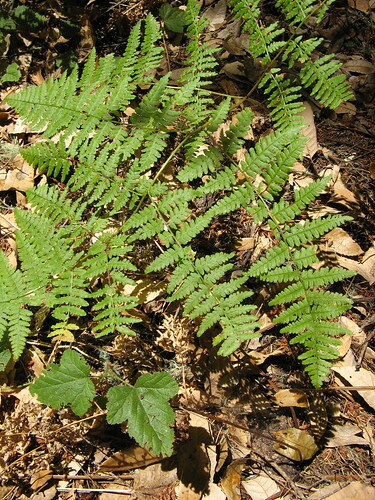 This week it was a few hours at Portola Redwoods State Park with Mike Wimble and a few of the FOMFOK regulars (Kathy had to stay at home this week, alas). On the right day, a few hours with familiar faces on mildly strenuous trails is the equal of any 15-mile marathon day. Sunday was one of those days. 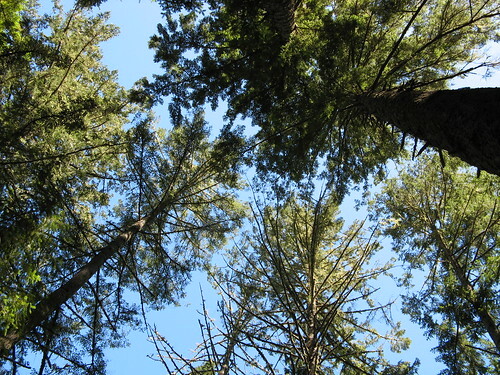 Sunny and warm in the valley, breezy and cool at Portola Redwoods. We also hiked some previously unhiked trails at the state park and decided this is a place whose charms become more evident only after multiple visits. It ain’t no Big Basin, which is apparent on the first visit; each time I go, I see more reasons why that’s a good thing. 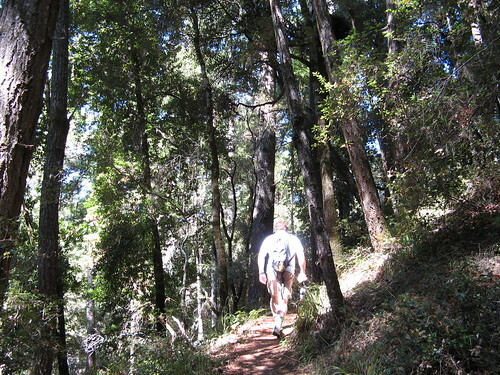 The route was uncomplicated: Headquarters to Iverson Trail to Coyote Ridge Trail, returning on the Tarwater Loop Trail and taking the Pomponio Creek Trail back to the HQ. Six or so miles with a few hundred feet of ascent and a similar descent. The Tarwater/Pomponio section is actually in Pescadero Creek County Park, a locale where I’m planning further explorations. 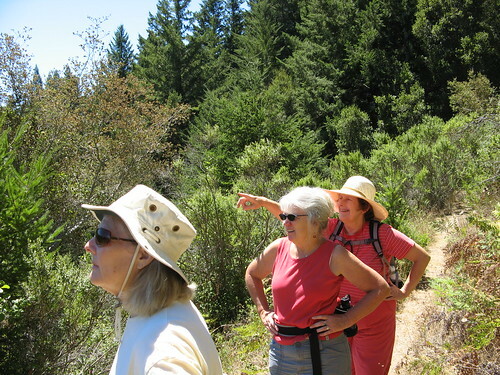 The Tarwater trail goes through a range of mixed forest — a smattering of old growth redwood, lots of new growth redwood, the ever-present Douglas fir and some madrone/oak/manzanita scrub thrown in for good measure. A lovely walk, and all downhill. Excellent greenery along the way. 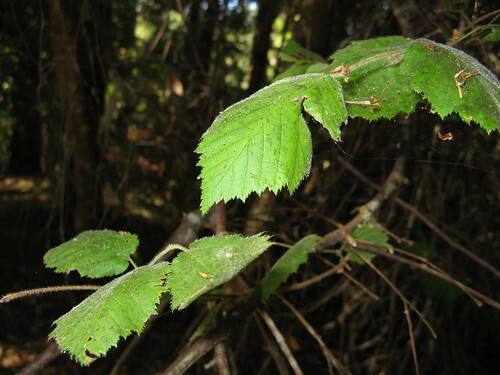 The flash reveals bits of fuzz and moisture on leaves along the trail. 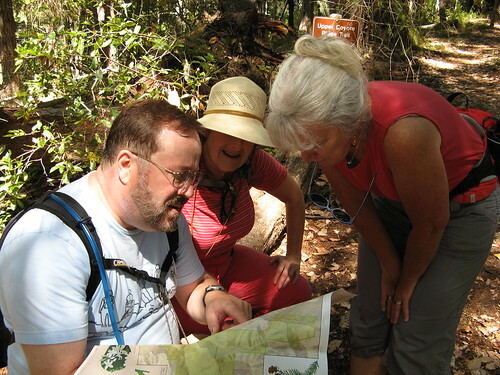 Mike, Peggy and Donna consult the map near the junction of Coyote Ridge Trail and Upper Coyote Ridge Trail. The former heads back down into the park, the latter goes up to the Tarwater Trail intersection. We opt for more climbing because we’ve gone barely a mile and haven’t endured nearly enough punishment yet. 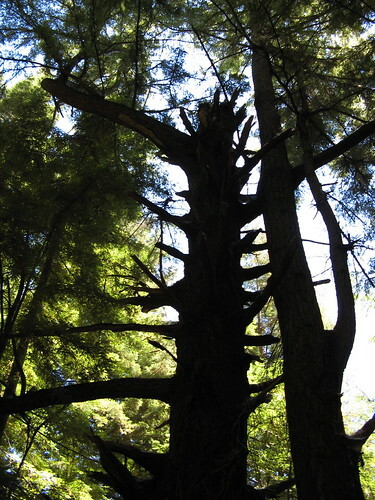 You know me and my thing for dead trees…. Sometime you post the picture of the vista, sometimes you post the picture of people enjoying the vista. 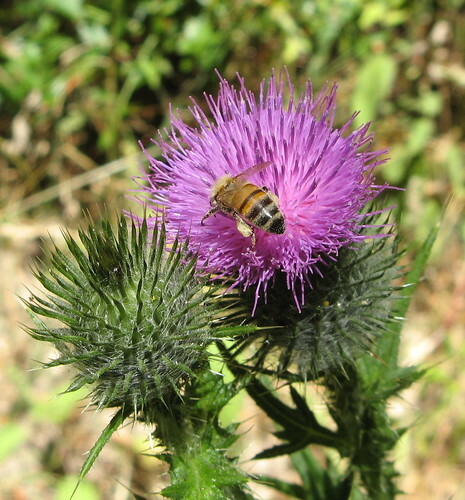 A bee on the hunt on a thistle, along the Pomponio Trail.